Azerbaijan's president has warned the country is ready to return to war with Armenia - on the 10th anniversary of a ceasefire between the two. Ilham Aliyev said he was trying to find a peaceful solution to the Nagorno-Karabakh conflict, but the Azeri army was prepared to "free" the territory. Ministers from both sides are reportedly meeting to try to agree a peace settlement. But our correspondent says relations are, if anything, worse than ever. "We are trying to resolve this problem by peaceful means but so far we have not been able to achieve that," Mr Aliyev said at a military base just a few miles from the border with Armenia. "We must increase our military potential. Our army is able at any moment to free our territory," he said, according to the AFP news agency. "We have every right to do that, to restore our territorial integrity, and international law is on our side since Armenia violated all international norms." Mr Aliyev added that government expenditure on Azerbaijan's military was increasing each year, "and it will keep increasing in the future". 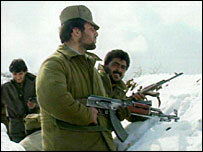 The leaders of the two countries signed a ceasefire in May 1994, but there is sporadic fighting along the ceasefire line. The foreign ministers of both countries were meeting in Strasbourg, and were expected to discuss Armenia returning some of the Karabakh regions to Azeri control, in exchange for reopening transport links. But the peace process appears to be going nowhere, says the BBC's Chloe Arnold in the capital Baku. The ceasefire ended five years of hostilities which erupted when the Soviet Union collapsed, and Armenians living in the mountainous territory of Karabakh demanded independence from Soviet Azerbaijan. Thousands died and one million were forced out of their homes in the conflict. Our correspondent says there is growing impatience with the peace process in Azerbaijan, where many ordinary people here now say the only way to resolve the dispute is to go back to war.